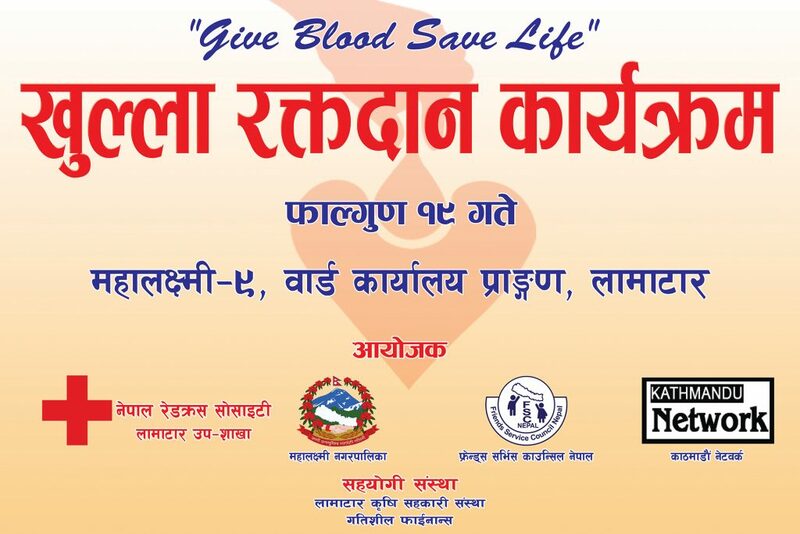 We would like to inform all concerned personality with the slogan of “together for Humanity, together for Blood” Friends Service Council Nepal (FSCN), Nepal Red Cross Society Lamatar Sub-Chapter, Mahalaxmi Municipality Office ,Kathmandu Network and Lamatar Agriculture Cooperative are jointly organizing ” Open Blood Donation Program” on 3rd March(19th Falgun) at Mahalaxmi-9, Lamatar. So FSCN on behave of all organizers, would like to invite you all for the humanitarian help by blood donation. Also we would like to request you for inviting friends, family or anyone from your networks who are interested for this holy endeavor.